Blitz Music presents two top bands at one event – Nuway Army, the UK’s top tribute to Gary Numan – and Black Celebration, the utilmate homage to Depeche Mode. We’re also thrilled to announce that Ade Orange (formely keyboardist with Gary Numan) will be playing guest keyboards with Nuway Army. The best early Numan and a smorgasbord of Depeche Mode’s back catalogue, peppered with a big helping of your favourite Blitz Music DJ sets, promises an absolute treat for electronica and 80’s music fans! 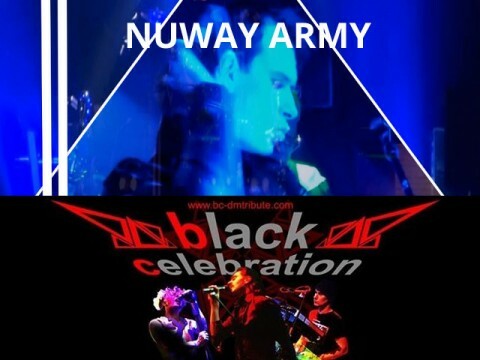 Starting back in 2001, Nuway Army have steadily grown their reputation as the UK's leading Gary Numan tribute band. Their dedication to faithfully recreating Numan's earlier work makes for an unmissable feast of sound & vision. Numanoids will also be impressed by the recent guest appearances of Ade Orange - Gary Numan's keyboardist for 22 years. Numan aficionado or 80's electronica fan? Nuway Army are not to be missed! United in their love of Depeche Mode and driven to provide fans with a quality outlet for their devotion, a group of friends formed Black Celebration back in 2001. With their unwavering determination to be the definitive tribute, Black Celebration have recreated the very essence of Depeche Mode - from the synth pop of the early 80's through to the polished dark electronica of the band's current output. Playing across the UK and Europe, Black Celebration are the nearest thing you can get to the original. Love DM? Then you're going to love Black Celebration!